You are here: Home / Antisemitism / Trump and Israel: True Love or Biblical Obligation? 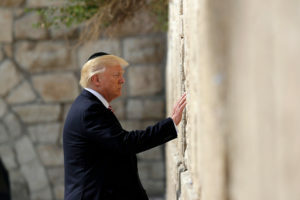 After less than a year in office, Donald Trump has done more to restore America’s relationship with Israel than in the 8 years of the previous administration. These days, supporting Israel is a dangerous proposition for anybody from governments to institutions, to organizations all the way down to individuals. 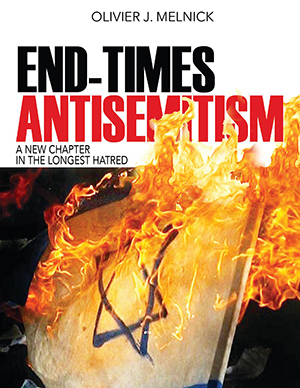 Over the last few decades, Israel has become a pariah state in the Middle East and much of the rest of the world. Supporting the Jewish State is often seen as racist or colonizing. Lasting peace between Israelis and Palestinians appears as the Holy Grail of global diplomacy. There hasn’t been a US President since the rebirth of modern Israel in May of 1948 that hasn’t endeavored to bring peace between Israelis and Arabs in the volatile Middle East. They all tried different methods, and they all pretty much failed, even if some degree of success was attained, like the Peace Treaty between Egypt and Israel under Jimmy Carter. • In May 2017, within months of his inauguration, President Trump visited Israel, making him the first sitting US President coming to the Old City and the Western Wall. • Donald Trump made a campaign promise to move the American Embassy from Tel Aviv to Jerusalem. Receiving a lot of criticism, He has moved away from that promise since, but just re-affirmed the US desire to move forward with the historic move. • In a joint press conference at the White House in February 2017–less than a month after taking office, Mr. Trump declare that he was opened to both a One-State solution and a Two-State solution, depending on what both sides agree upon. In other words, possibly for the first time since the re-birth of Israel in 1948, a US President is not trying to force an agenda on Israel as much as he is trying to find a viable solution for both sides. • President-Elect Trump nominated South Carolina Governor Nikki Haley to be the 29th US Ambassador to the United Nations, and Miss Haley has proven to be a very vocal supporter of Israel. As a governor, she was the first to pass an anti-BDS law in the state of South Carolina. • Mr. Trump is also talking to Mahmoud Abbas about peace in the Middle East. Originally, Mr. Trump on his first ever phone call to Abbas, and within minutes invited him to Washington D.C. Mahmoud Abbas appeared interested in moving forward, at least in his speech, but his actions thereafter didn’t really match his words. • Possibly as a result of Mr. Abbas’ incitement against Israel, Mr. Trump spoke about closing the Palestinian Liberation Organization’s office in Washington. It hasn’t happened yet and it might remain open with “limitations,” if the Palestinian Authority isn’t being honest. At first glance, some would accuse Mr. Trump of favoritism towards Israel, maybe blaming the fact that some of his family members are Jewish. But there might be another reason why the current US President shows so much support for the Jewish State, and that one has a biblical foundation. Vice-President Mike Pence has been very open about his beliefs. As an evangelical Christian, he understands that the Bible is replete with positive references about Israel and Jerusalem. Is it possible that Mr. Pence’s biblical worldview might be influencing President Trump? I am not implying that America has now turned into a country led by evangelicals, but what if, for the first time in decades, there was a strong biblical influence in the White House? Some even believe that President Trump has become an evangelical Christian himself. One doesn’t need to be a supporter or opponent of the Trump administration to admit that Israel is very important to our current President. Is it true love or biblical obligation? as we can read in the Abrahamic Covenant of Genesis 12:3 “I will bless those who bless you, I will curse him who curses you,” God made a covenant with Abraham promising to bless those who bless his descendants through Isaac and Jacob and the twelve tribes of Israel, i.e. : The Jewish people. If indeed, Mr. Trump chooses to align his foreign policy towards Israel with biblical truth, he is fulfilling the Abrahamic Covenant. Time will tell how God will bless Mr. Trump and even America, but the biblical promise of blessings received for blessing Israel eternally stands. Thank you, Mr. Trump!